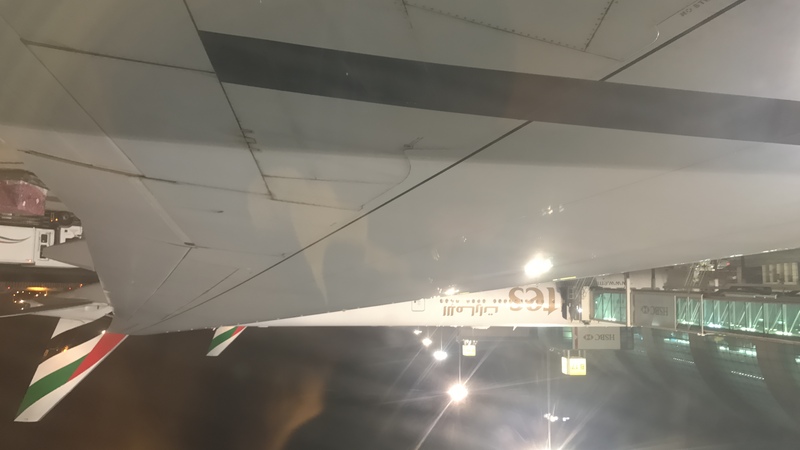 After spending a few hours in Mumbai’s gorgeous T2, it was time to fly to Dubai for the first leg of the return segment. 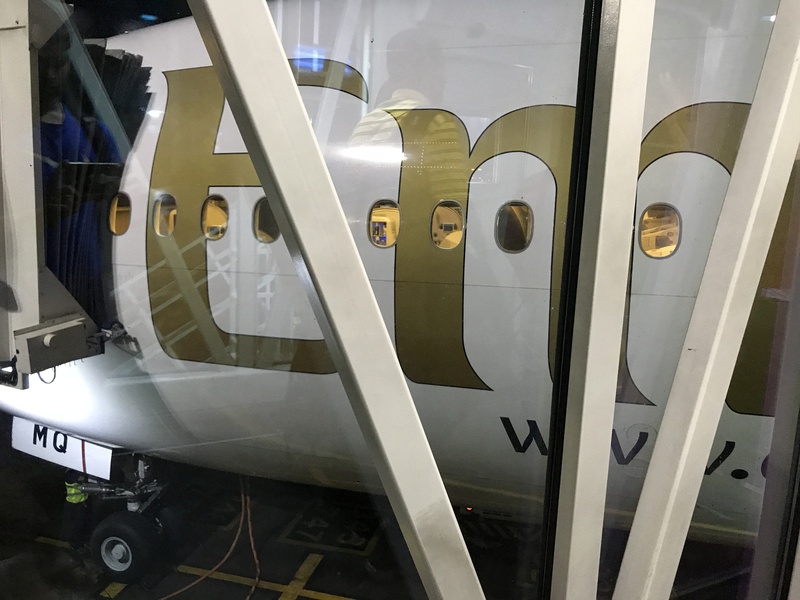 Now one thing I want to clarify on this report that many people had asked me about is the type of aircraft I traveled on. People corrected saying it should be Boeing 777-300ER, not Boeing 777-300. No. 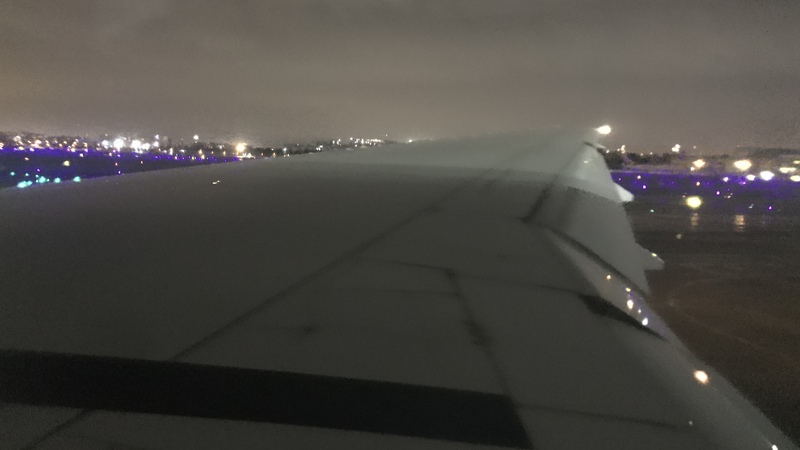 Our aircraft was indeed a Boeing 777-300 and there are a few differences between the two like engine type and raked/unraked wingtips. 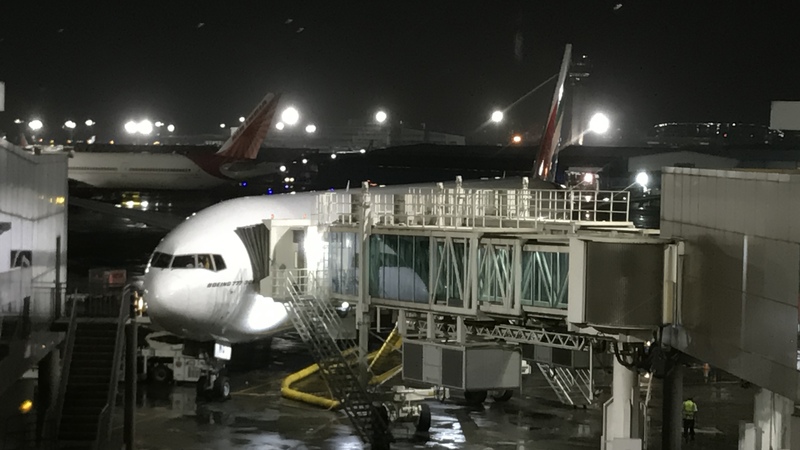 We were supposed to have the 777-300ER but there was an equipment swap which updated on EK’s website about a day and a half before flight time. 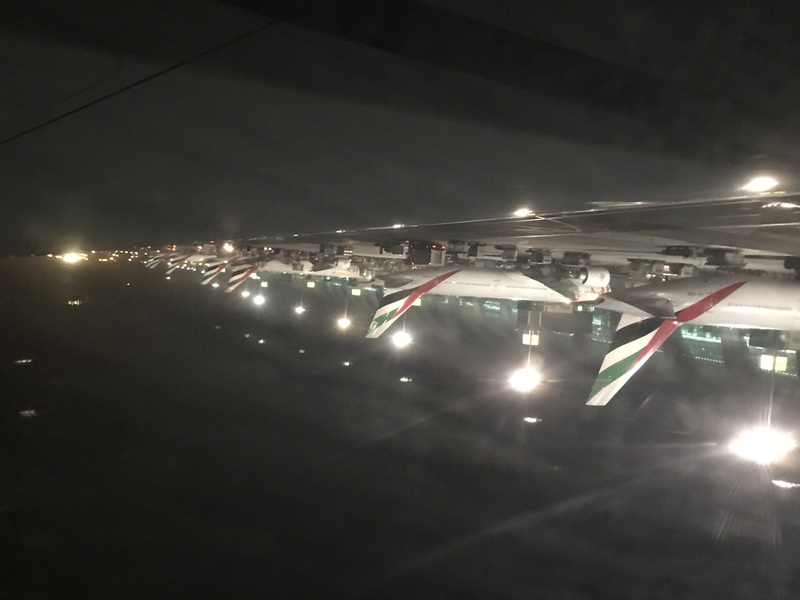 Ultimately this didn’t change too much, but I will say this flight was not as good as other Emirates flights I have taken. There were several great aspects, but there is always room for improvement. We boarded through the second door, crossed through the galley and turned right into the business class section. 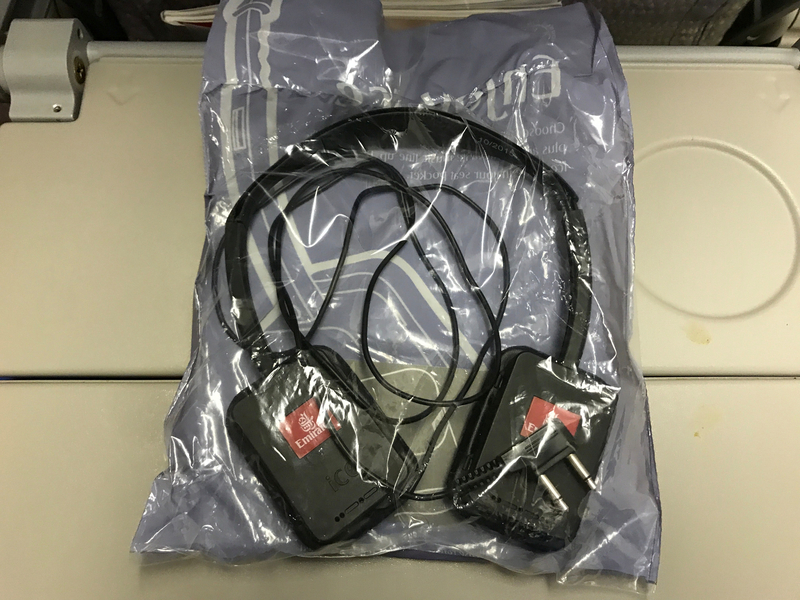 I’ve flown this product in the past and as a hard product, its a letdown. The seat is almost flat, but not completely. 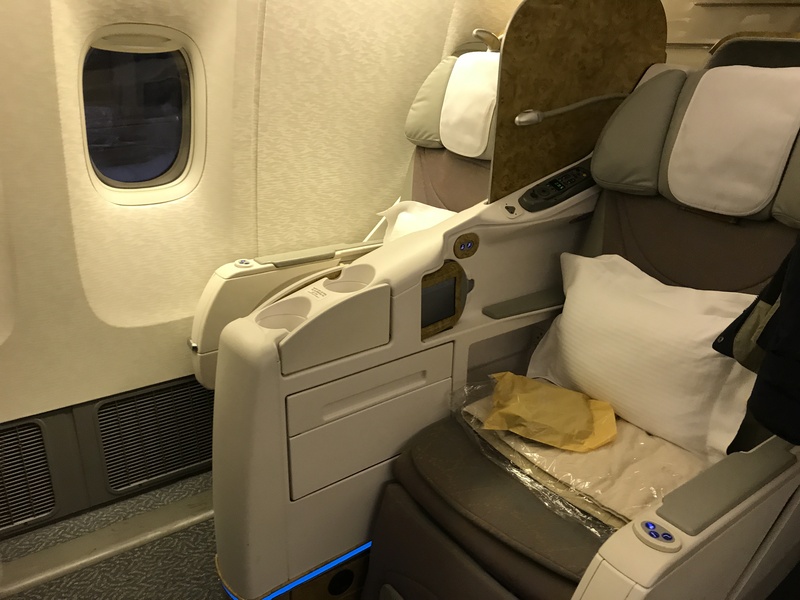 But more importantly, the lack of direct aisle access and privacy on Emirates’s 777 business class are something that most of Qatar and all of Etihad’s widebody business class seats do a great job on. But we’ll save the business class review for some other time. Now to the back. One serious complaint that I have was that my tray table was broken. What that meant was that every time there would be any service, my feet had to be on tippy toes so my knees could rise and hold the tray table straight to prevent anything from sliding off thr tray table. This was very painful as you will see later in the report. The legroom seemed alright but a little tight, though I think the narrow seats played a role in that. Also, the 3-4-3 does not help the situation. In my opinion, 777s were never meant to be 3-4-3 but rather 3-3-3. I’ll definitely do my best to avoid EK’s 777s in economy on future flights. Despite being retrofitted, the TV’s were still old style like how they were in their old seats. 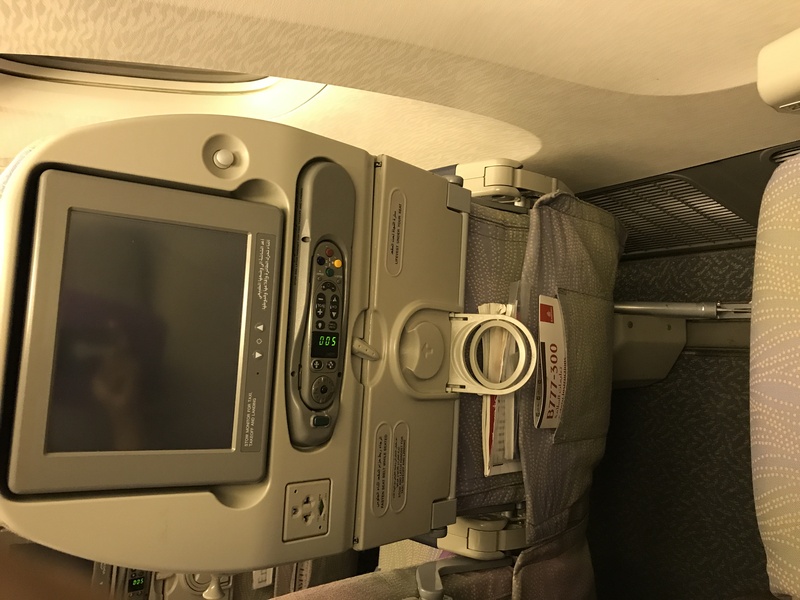 One thing that I do appreciate however is that there is a power port which is great and something many airlines are still catching up on in economy class. Now here are some of the amenities you get in flight. They also bring around plastic water cups which is EK’s version of economy class “pre-departure drinks”. 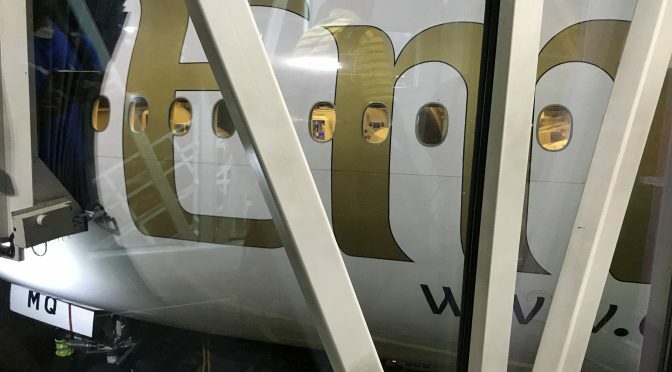 I appreciate this as not many airlines do it. 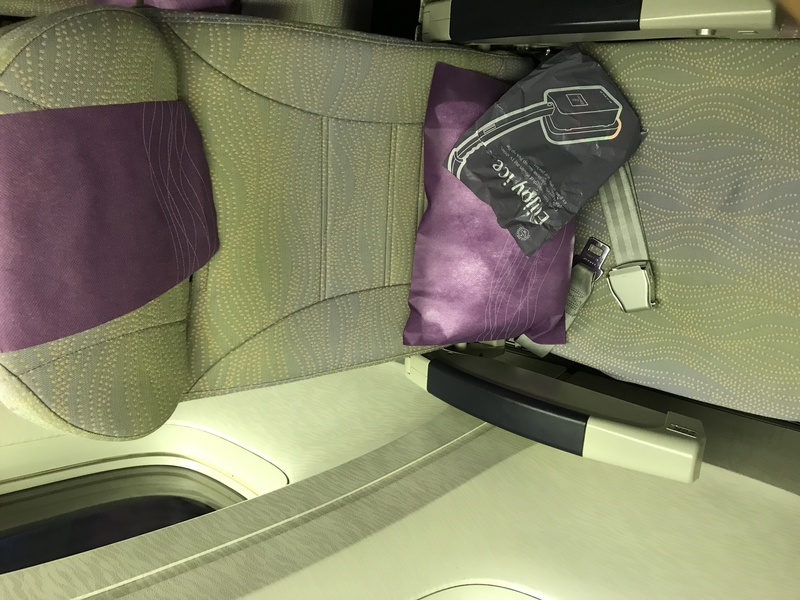 You are also provided with a pillow and blanket to use which I think for a 3-hour flight is great. 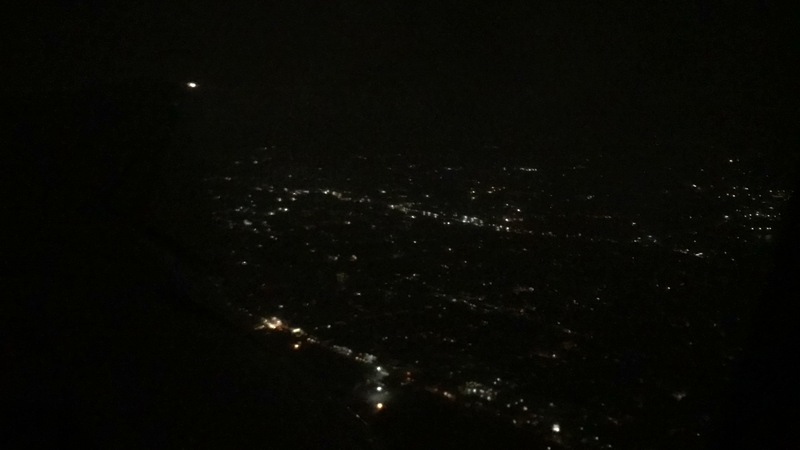 My relative enjoyed them and slept most of the flight while I stared out into the darkness for most of the flight. Eventually boarding completed and we began pushback a few minutes early. 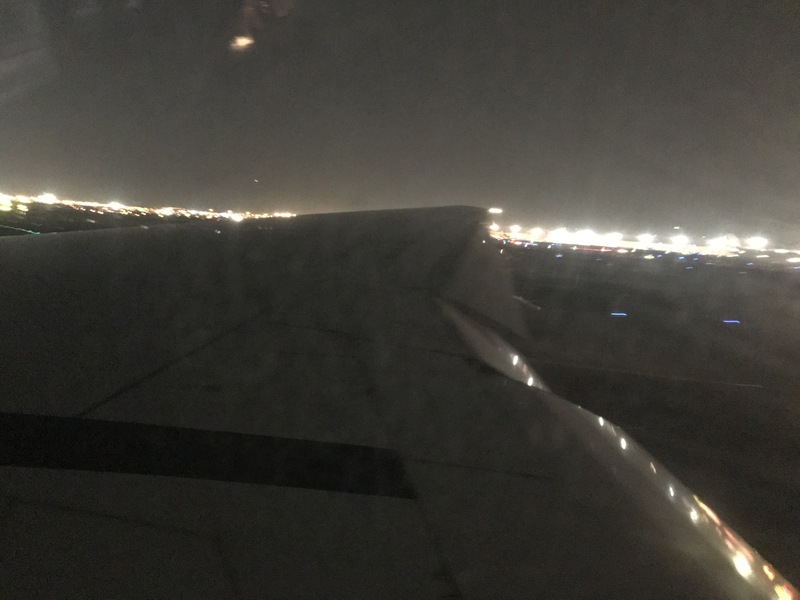 After a 10 minute taxi to runway 27, we had a normal length takeoff roll for a 777, and a quick climb out of rainy Mumbai. After we crossed 10,000 feet, the seatbelt sign was switched off and the crew immediately got to work. 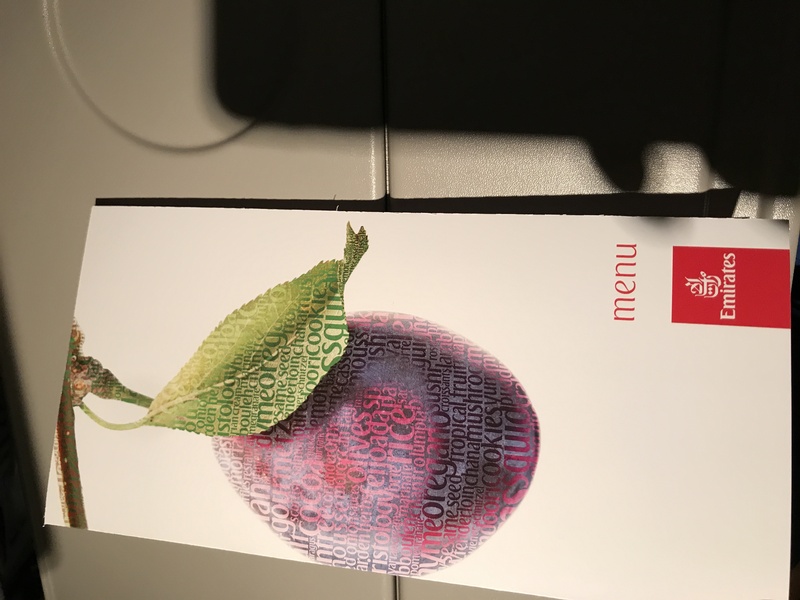 They came around with menus for each passenger for the flight. 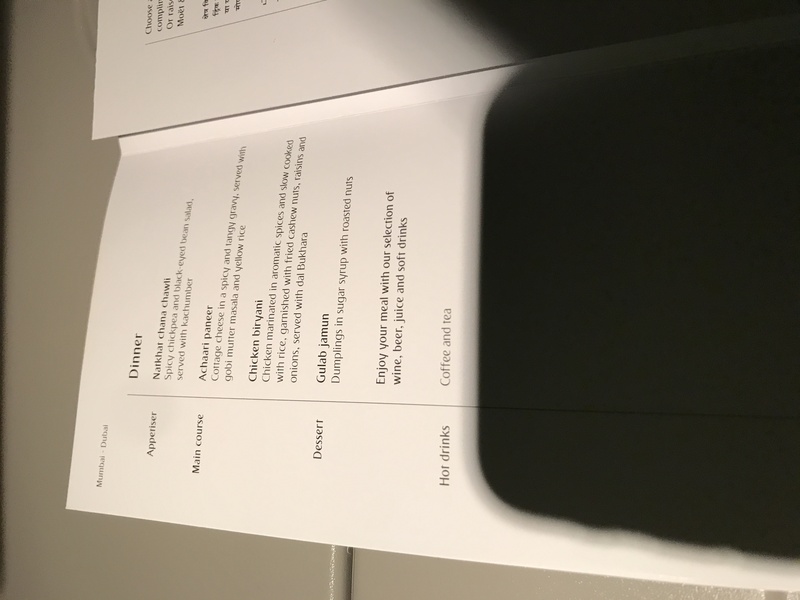 I’ve mentioned this many times before but I really appreciate when airlines give menus in economy, even on a 3-hour flight like this one, as it shows they really care about their economy soft product. 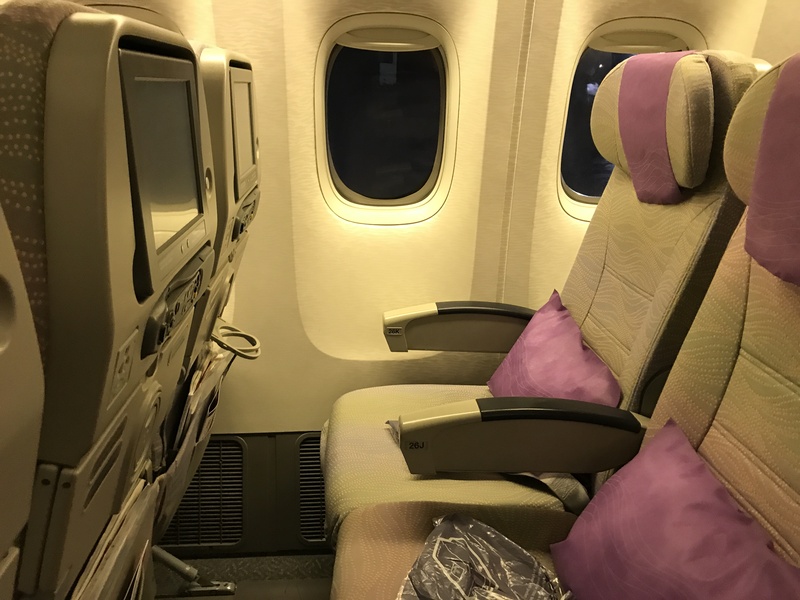 Most airlines invest in their premium cabin experience, but not economy. Now granted EK does receive some government subsidies, but still kudos to them for investing in their soft product. 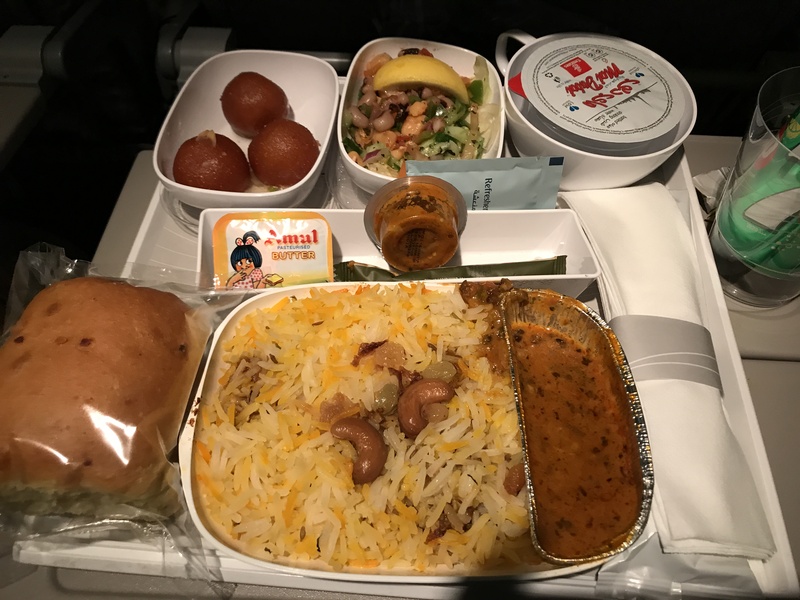 The menu looked just like what was served on my inbound flight from Dubai to Mumbai with a slight difference. 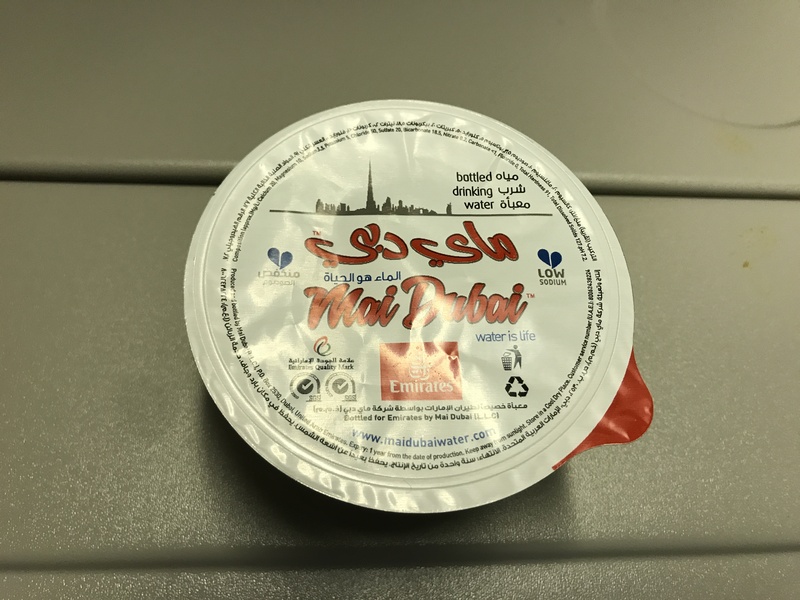 Now for the main course, Emirates didn’t fail to impress again in economy class. 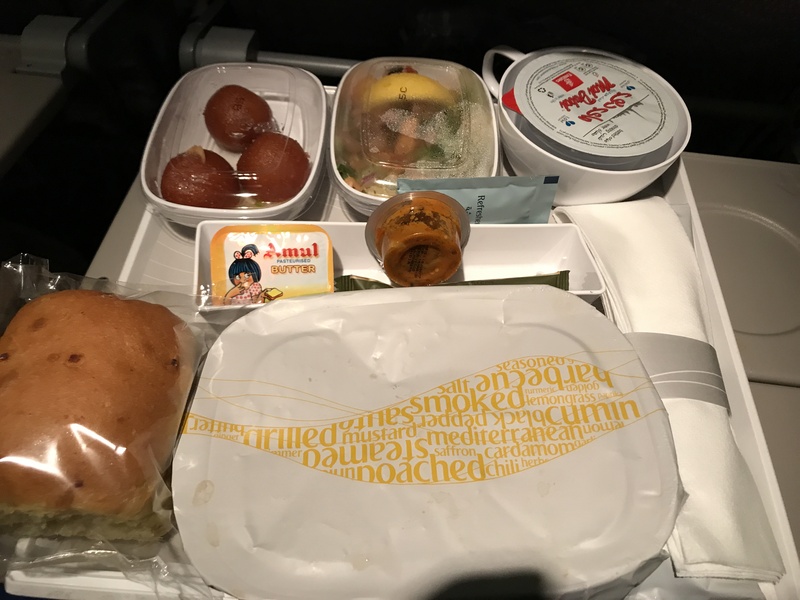 Once again, Emirates delivered this economy class meal very well for the most part. The appetizer was a kind of lentil salad that was chilled and refreshing but lacked taste. Though that isn’t a bad thing because we are at an altitude and lentils as they are don’t have much taste by themselves anyways. But squeezing lemon made it taste much better after that. I went with the chicken biriyani for my main course. The flavor, when mixed with the lentils curry, was very tasty and I enjoyed it greatly. The rice was heated properly and the chicken was cooked adequately and was not hard. The dessert, called Gulab Jamun was well done as well in terms of freshness and proper texture. As an Indian, I know what I high-quality gulab jamun tastes like, and this was almost there. 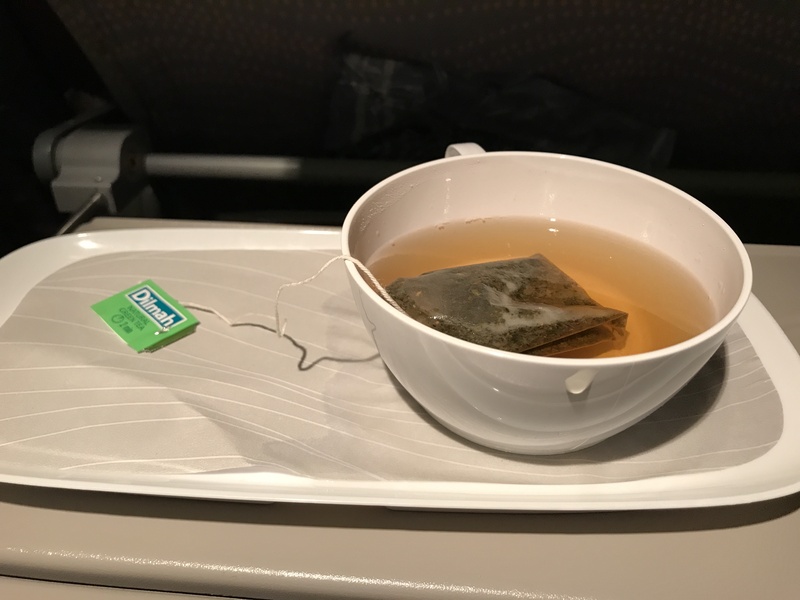 Overall, the meal was great but the biggest issue I had was the tray table. As I had mentioned earlier, its broken such that it leans downward so everything slides off it if left alone. The tray table also did this so I had to sit on tippy-toes to keep my knees on the tray table to prevent it from falling. About an hour after dinner, I decided to have some green tea. They took about 10 minutes to bring it, but they finally brought it. This time I had to be ultra careful, because if the tray even drops slightly abruptly, then I will have spilled some VERY VERY HOT water spill on me. After a couple sips I put the tea down on the tray and forgot my tray was broken so I let my knees go. The next 5 seconds after that were amongst the most painful I’ve felt in a while. Hot water spilled and burned my skin on the spot. 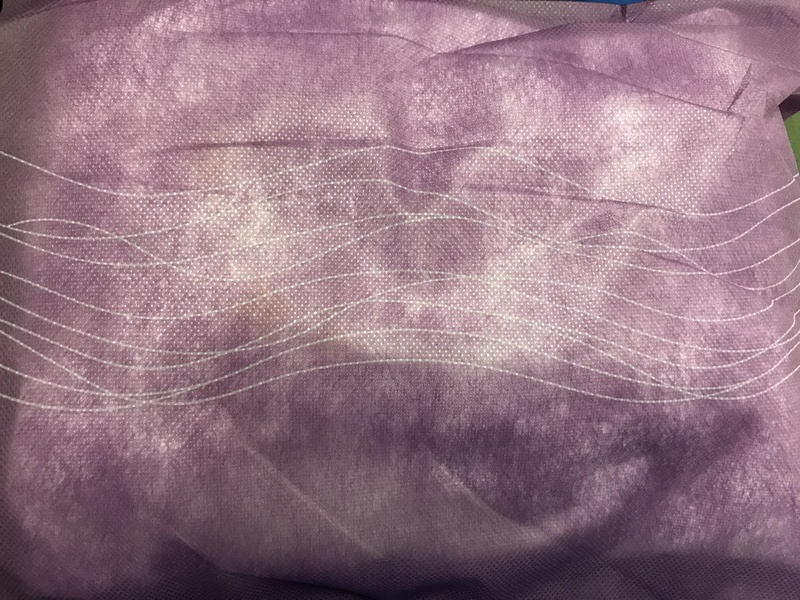 Poor job on my part, but more importantly, poor job on maintenance by EK. Additionally, not once did I see a single smile from any of the crew members on my side. I have different expectations for the service between first class, business class, and economy class. All I ask for in economy class is that they look like they want to be there. Nothing more. The service was as normal as what I expected but without any smiles. Eventually, we entered the Arabic Peninsula and began our descent. 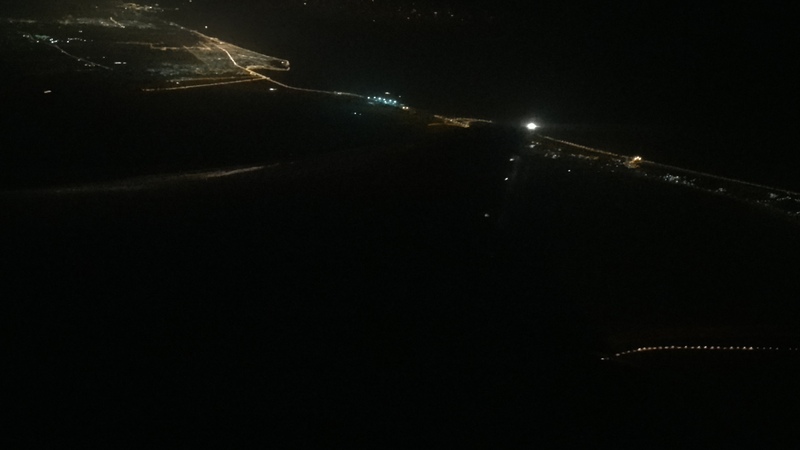 This area was very air traffic heavy so there were planes constantly around us as we navigated our way to DXB through the hot Arabic night. Guess what? That green teacup that I drank out of, no crew ever collected it. So there’s another negative to add to the list. 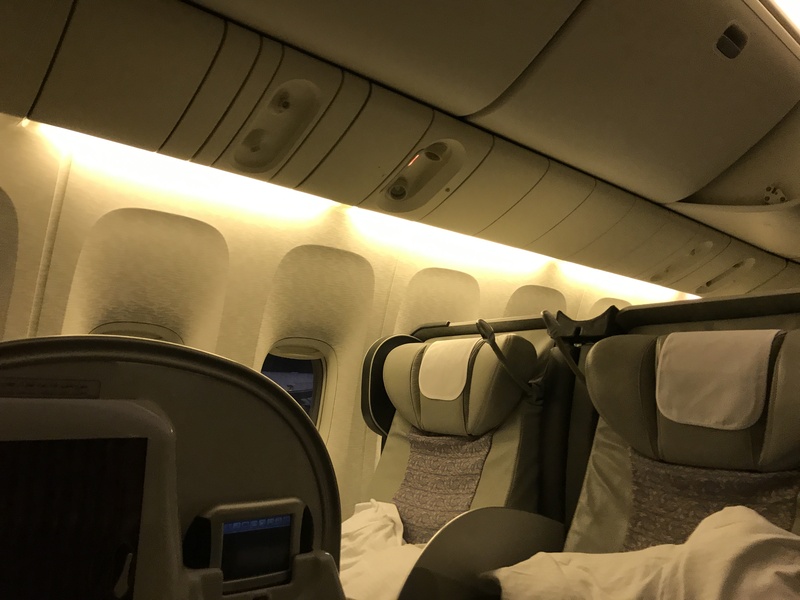 My relative had to semi-open her tray table on descent (which isn’t allowed) because there was no other room for it anywhere. 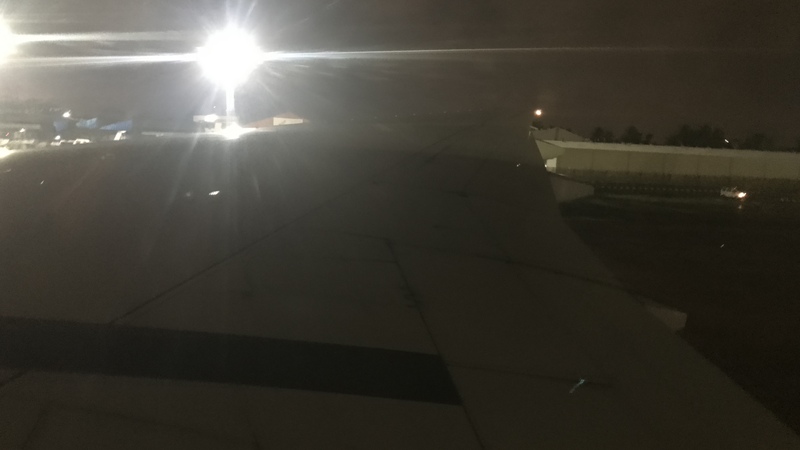 Bad picture, but a smooth touchdown a couple minutes early.